Tauck's Christmas market tour and river cruise along the Rhine, from Köln to Basel aboard ms Grace or ms Inspire, is the perfect way to capture all the magic of Christmas Markets in Germany and France. 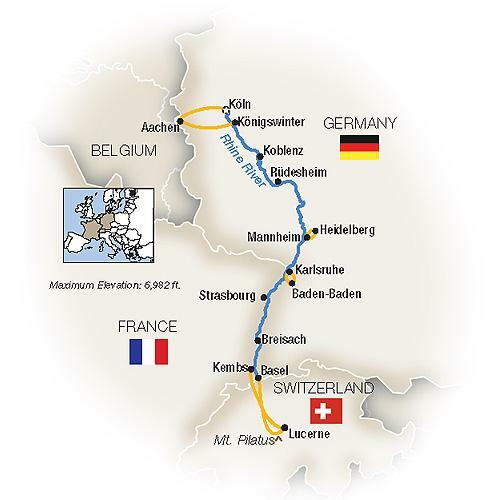 Along with all the inclusions that are part of every Tauck river cruise, Tauck's Christmas market tours wow you with special holiday touches like an onboard tree-trimming party... glühwein and other seasonal treats aboard the riverboat... a traditional European Christmas dinner with all the fixings... special evenings of onboard holiday-themed entertainment... visits to markets in cities like Aachen that other holiday cruises don't visit... walking in the footsteps of celebrities at the Kurhaus casino in Baden-Baden... a lecture on Alsatian storytelling traditions in Strasbourg... a cookie-making demonstration and a visit to the fanciful Siegfried's Mechanisches Musikkabinett in Rüdesheim... a traditional German lunch in Heidelberg with award-winning local beer, and much more! All nights are spent cruising aboard your Tauck riverboat.